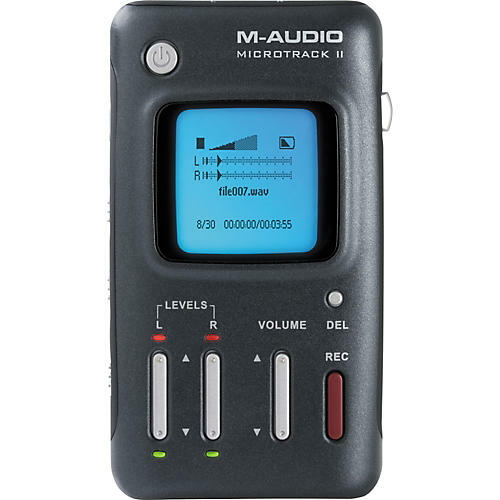 Quality audio capture for field recording or songwriting made easier. What are the main things plaguing professional field recording? Wild levels, poor mics, and limited storage. The redesigned MicroTrack II solves all that with an extended input gain range for capturing quiet sounds, an analog input limiter to tame unexpected bursts of sound, 48V phantom power for pro condenser mics, seamless recording of files beyond 2GB, and other enhancements. The MicroTrack II delivers one of the highest quality mobile recording experiences available today. Simply record WAV, BWF, and MP3 files to CompactFlash or Microdrives through balanced line inputs or built-in microphone preamps--then drag and drop recordings to your computer via high-speed USB 2.0 for immediate editing or Web posting. MicroTrack II is perfect for a wide variety of applications including field recording, capturing live shows, songwriting, education, and more.